Psychic mediums are people who make connections with those who have died and crossed over to the other side. An important distinction to make is that all mediums are psychics, but not all psychics are mediums. Mediums also rely on spiritual energies outside of themselves to discern information, whereas psychics may not. There are three main types of mediumship that mediums employ to make connections with people from beyond the grave: mental mediumship, trance mediumship, and physical mediumship. Each of these three branches operates in a slightly different way. This type of mediumship involves the medium communicating with those who have passed on through telepathy. Spirits communicate with the medium through several different “clairs”. Mediums can see spirits through clairvoyance, hear spirits through clairaudience, feel spirits through clairsentience, or know spirits through claircognizance. This is the most common and widely recognized form of mediumship. Some consider trance mediumship to be a form of mental mediumship, but many think of it as a separate category in its own right. Generally, a spirit uses the medium’s mind temporarily to convey a message to their loved ones who are still alive. The medium’s mind metaphorically steps aside for a moment to let the spirit communicate. Often the trance is not completely overpowering. Many trance mediums say that they still know what is going on where they are. They are just also very aware of another time and place that the spirit is transmitting to them. This is considered a more direct form of communication with spirits than generic mental mediumship. 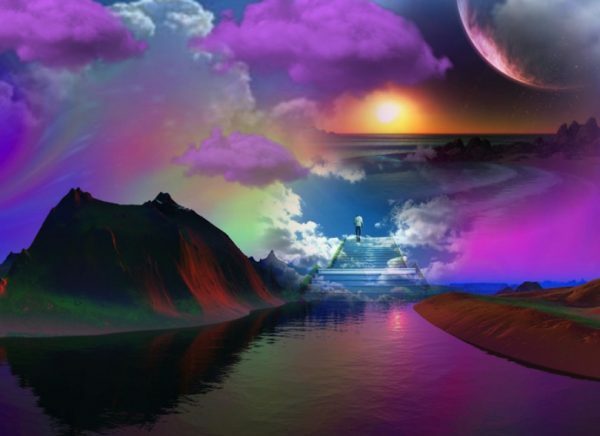 This is because instead of vague images and sounds being presented to the medium, it is often much more complete and coherent information that is passed directly from the spirit world. Sometimes spirits allow the trance mediums to speak for them, even in a different language that the medium may not even know. Transfiguration: The appearance of a spirit’s face over the face of the medium or the sitter. Direct Voice: The voice of a spirit can be directly heard. Usually, it is helped with the use of a trumpet that sits in the middle of the room during the event. Apports: This phenomenon is when an object from one place vanishes and rematerializes in another place. Mediums generally don’t try to make this happen. Often it is just an extra gift or message that the spirit chooses to impart. Levitation: The movement of an object through supernatural means. Raps or Knocks: Noises that may be used for communication with the spirit such as if a code is established: one knock for yes, two knocks for no. Spirit Lights: In rare occasions, lights of various colors can be seen by those in the psychic circle. They are a representation of the spirit’s presence. Ectoplasm: This usually involves spirits using a combination of chemicals from their world mixed with bodily fluids from the medium to create a solution that may then manifest in some sort of structure. These fluids usually exit the medium’s body through either the nose or the mouth. Materializations: The manifestation of form with elements from this world and what lies beyond. They can often take the shape of the spirit in this world or in theirs. Manifestations are one of the most impressive phenomena known to the world of mediumship. Physical mediumship takes many forms, but it is not as well known because of its difficulty to engage in. Mediums who participate in this form of mediumship are often quite fatigued by the experience and can even experience a hangover-like state for several hours or even days after the event. Physical mediumship takes a huge toll on the medium’s body physically as well as their mind emotionally, and this is why it is not commonly practiced today. In order to become a physical medium, one must be in a stable physical condition, possess great amounts of patience, and have the proper elements within their body composition to assist in the creation of ectoplasm. Although the practice of mediumship has been riddled with fraudulent psychics, it still remains a popular way for those grieving the loss of a loved one to find closure. It has even led to several popular television shows such as Long Island Medium. Mediumship has been practiced for hundreds of years and will likely continue well into the future.